For other uses, see Faiyum (disambiguation). Faiyum (Arabic: الفيوم‎ el-Fayyūm pronounced [elfæjˈjuːm], borrowed from Coptic: ̀Ⲫⲓⲟⲙ or Ⲫⲓⲱⲙ Phiom or Phiōm from Ancient Egyptian: pꜣ ym "the Sea, Lake") is a city in Middle Egypt. Located 100 kilometres (62 miles) southwest of Cairo, in the Faiyum Oasis, it is the capital of the modern Faiyum Governorate. Originally called Shedet in Egyptian, the Greeks called it Koinē Greek: Κροκοδειλόπολις Krokodilópolis, the Romans Arsinoë. It is one of Egypt's oldest cities due to its strategic location. Its name in English is also spelled as Fayum, Faiyum or Al Faiyūm. Faiyum was previously officially named Madīnet Al Faiyūm (Arabic for The City of Faiyum). The name Faiyum (and its spelling variations) may also refer to the Faiyum Oasis, although it is commonly used by Egyptians today to refer to the city. "Crocodilopolis" redirects here. For the namesake cities in Upper Egypt and Paralia, see Crocodilopolis (disambiguation). Archaeological evidence has found occupations around the Fayum dating back to at least the Epipalaeolithic. Middle Holocene occupations of the area are most widely studied on the north shore of Lake Moeris, where Gertrude Caton Thompson and Elinor Wight Gardner did a number of excavations of Epipalaeolithic and Neolithic sites, as well as a general survey of the area. Recently the area has been further investigated by a team from the UCLA/RUG/UOA Fayum Project. In ancient Egypt, the city was called Shedet. The 10th-century Bible exegete, Saadia Gaon, thought el-Fayyum to have actually been the biblical city of Pithom, mentioned in Exodus 1:11. It was the most significant centre of the cult of the crocodile god Sobek (borrowed from the Demotic pronunciation as Koinē Greek: Σοῦχος Soûkhos, and then into Latin as Suchus). In consequence, the Greeks called it "Crocodile City" (Koinē Greek: Κροκοδειλόπολις Krokodeilópolis), which was borrowed into Latin as Crocodīlopolis. The city worshipped a tamed sacred crocodile called in Koine Petsuchos, "the Son of Soukhos", that was adorned with gold and gem pendants. The Petsoukhos lived in a special temple pond and was fed by the priests with food provided by visitors. When Petsuchos died, it was replaced by another. Under the Ptolemaic Kingdom, the city was for a while called Ptolemais Euergétis (Koinē Greek: Πτολεμαὶς Εὐεργέτις). Ptolemy II Philadelphus (309–246 BC) renamed the city Arsinoë and the whole nome after the name of his sister-wife Arsinoe II (316–270 or 268), who was deified after her death as part of the Ptolemaic cult of Alexander the Great, the official religion of the kingdom. Under the Roman Empire, Arsinoë became part of the province of Arcadia Aegypti. To distinguish it from other cities of the same name, it was called "Arsinoë in Arcadia". With the arrival of Christianity, Arsinoë became the seat of a bishopric, a suffragan of Oxyrhynchus, the capital of the province and the metropolitan see. Michel Le Quien gives the names of several bishops of Arsinoë, nearly all of them associated with one heresy or another. Fayyum was the seat of Shahralanyozan, governor of the Sasanian Egypt (619–629). Faiyum is the source of some famous death masks or mummy portraits painted during the Roman occupation of the area. The Egyptians continued their practice of burying their dead, despite the Roman preference for cremation. While under the control of the Roman Empire, Egyptian death masks were painted on wood in a pigmented wax technique called encaustic—the Faiyum mummy portraits represent this technique. 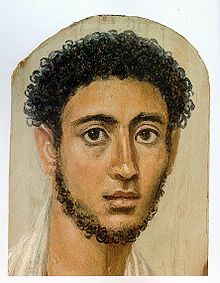 While previously believed to represent Greek settlers in Egypt, modern studies conclude that the Faiyum portraits instead represent mostly native Egyptians, reflecting the complex synthesis of the predominant Egyptian culture and that of the elite Greek minority in the city. ^ a b c Paola Davoli (2012). "The Archaeology of the Fayum". In Riggs, Christina (ed.). The Oxford Handbook of Roman Egypt. Oxford University Press. pp. 152–153. ISBN 9780199571451. ^ "The name of the Fayum province. Katholieke Universiteit Leuven". Trismegistos.org. Archived from the original on 2012-02-29. Retrieved 2013-01-15. ^ "Faiyum. Eternal Egypt". 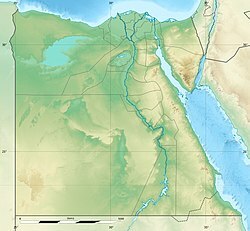 Eternalegypt.org. Archived from the original on 2012-02-13. Retrieved 2013-01-15. ^ Caton-Thompson, G.; Gardner, E. (1934). The Desert Fayum. London: Royal Anthropological Institute of Great Britain and Ireland. ^ Holdaway, Simon; Phillipps, Rebecca; Emmitt, Joshua; Wendrich, Willeke (2016-07-29). "The Fayum revisited: Reconsidering the role of the Neolithic package, Fayum north shore, Egypt". Quaternary International. The Neolithic from the Sahara to the Southern Mediterranean Coast: A review of the most Recent Research. 410, Part A: 173–180. doi:10.1016/j.quaint.2015.11.072. ^ Phillipps, Rebecca; Holdaway, Simon; Ramsay, Rebecca; Emmitt, Joshua; Wendrich, Willeke; Linseele, Veerle (2016-05-18). "Lake Level Changes, Lake Edge Basins and the Paleoenvironment of the Fayum North Shore, Egypt, during the Early to Mid-Holocene". Open Quaternary. 2. doi:10.5334/oq.19. ISSN 2055-298X. ^ Pettigrew, Thomas (1834). A History of Egyptian Mummies: And an Account of the Worship and Embalming of the Sacred Animals by the Egyptians : with Remarks on the Funeral Ceremonies of Different Nations, and Observations on the Mummies of the Canary Islands, of the Ancient Peruvians, Burman Priests, Etc. Longman, Rees, Orme, Brown, Green, and Longman. p. 211. ^ Bunson, Margaret (2009). Encyclopedia of Ancient Egypt. Infobase Publishing. p. 90. ISBN 978-1-43810997-8. ^ Hornblower, Simon; Spawforth, Antony; Eidenow, Esther, eds. (2012). The Oxford Classical Dictionary. Oxford University Press. p. 171. ISBN 978-0-19954556-8. ^ Guillaume, Philippe (2008). Ptolemy the second Philadelphus and his world. Brill. p. 299. ISBN 978-90-0417089-6. ^ * Jalalipour, Saeid (2014). Persian Occupation of Egypt 619-629: Politics and Administration of Sasanians (PDF). Sasanika. Archived (PDF) from the original on 2015-05-26. ^ "History of Encaustic Art". Encaustic.ca. 2012-06-10. Archived from the original on 2012-12-23. Retrieved 2013-01-15. ^ "Egyptology Online: Fayoum mummy portraits". Archived from the original on August 8, 2007. Retrieved January 16, 2007. ^ Riggs, C. The Beautiful Burial in Roman Egypt: Art, Identity, and Funerary Religion Oxford University Press (2005). ^ Victor J. Katz (1998). A History of Mathematics: An Introduction, p. 184. Addison Wesley, ISBN 0-321-01618-1: "But what we really want to know is to what extent the Alexandrian mathematicians of the period from the first to the fifth centuries C.E. were Greek. Certainly, all of them wrote in Greek and were part of the Greek intellectual community of Alexandria. And most modern studies conclude that the Greek community coexisted [...] So should we assume that Ptolemy and Diophantus, Pappus and Hypatia were ethnically Greek, that their ancestors had come from Greece at some point in the past but had remained effectively isolated from the Egyptians? It is, of course, impossible to answer this question definitively. But research in papyri dating from the early centuries of the common era demonstrates that a significant amount of intermarriage took place between the Greek and Egyptian communities [...] And it is known that Greek marriage contracts increasingly came to resemble Egyptian ones. In addition, even from the founding of Alexandria, small numbers of Egyptians were admitted to the privileged classes in the city to fulfill numerous civic roles. Of course, it was essential in such cases for the Egyptians to become "Hellenized," to adopt Greek habits and the Greek language. Given that the Alexandrian mathematicians mentioned here were active several hundred years after the founding of the city, it would seem at least equally possible that they were ethnically Egyptian as that they remained ethnically Greek. In any case, it is unreasonable to portray them with purely European features when no physical descriptions exist." Chisholm, Hugh, ed. (1911). "Fayum" . Encyclopædia Britannica. 10 (11th ed.). Cambridge University Press. p. 219. ^ "The Temple and the Gods, The Cult of the Crocodile". Umich.edu. Archived from the original on 2012-10-13. Retrieved 2013-01-15. ^ a b "Al Fayoum, Egypt". Voodoo Skies. Archived from the original on 24 February 2014. Retrieved 17 July 2013. ^ "Climate: Faiyum - Climate graph, Temperature graph, Climate table". Climate-Data.org. Archived from the original on 13 December 2013. Retrieved 17 August 2013. Wikimedia Commons has media related to Faiyum. Wikivoyage has a travel guide for Faiyum.